Johannesburg - South Africa's Olympic Games team will return home on Tuesday morning, and Lead SA and the department of sport and recreation have urged the public to give them a heroes welcome. 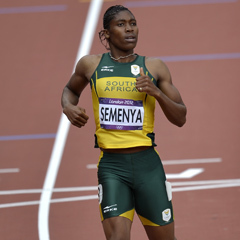 Silver medallist, Caster Semenya, the "Golden" rowing team of Sizwe Ndlovu, Matthew Brittain, James Thompson and John Smith and bronze medalist in K-1 500m kayak event, Bridgitte Hartley, will arrive from London on flight SA 237 at OR Tambo Airport at 08:20. Other Team SA team members will touch down on flight SA 235 scheduled for 07:20. Swimmers Cameron van der Burgh and Chad Le Clos, who returned home on Thursday, will be at the airport to join the other medallists. Supporters have been asked to bring their posters, banners, vuvuzelas and SA colours to welcome Team SA home.